With fixed locations, many stationary concessions tend to be able to store more items and utilize larger pieces of equipment than their mobile counterparts. Some stationary concessions include movie theaters and permanent sports arena food vendors. With the luxuries that come with utilizing a permanent space, many food storage equipments that you’d use in a regular kitchen can be used in stationary concessions as well. It boils down to which utility hookups are available and the space you have to work with. These ‘mini’ versions of standard refrigeration units are ideal for concessions due to their small footprint and easy accessibility. Countertop versions of freezer chests for ice cream are ideal for showcasing your ice cream selection while taking up as little space as possible. Best for quick-serve ice cream selections. If your concession stand is approved to sell alcohol (many stadiums have this luxury), then investing in simple beer taps and undercounter draft cooler systems are the way to go. Best for concessions serving alcohol. Cook large amounts of food and store in hot food holding cabinets to prepare for rush hours and peak traffic times. Best for rush hours, peak traffic times. For concessions with grab-n-go type items, investing in a merchandiser can drastically cut back on the amount of food you’ll have to prepare constantly during peak hours. Best for grab-n-go items and prepackaged items. Permanent concessions tend to have the ability to offer wider varieties of foods on their menu because they typically have more space to hold different types of food prep equipment. As the name implies, cheesemelters use tube-type heating to provide a gentle heat suitable for warming or melting cheese. Opt for a small model that can toast a few pieces at a time or a conveyor model for catering to peak guest times! Best for hotels offering breakfast concessions. Great for hotels or any concessions that offer sweet pastries, pancakes, waffles, or crepes! Best for hotels, concessions offering waffles, pancakes, or crepes. Mobile concessions need to utilize equipment with utility connections that are available in any given location, and these types of concessions tend to utilize smaller output equipment with smaller footprints. Mobile concessions include carnival vendors, theme park vendors without a permanent facility, street vendors, and mobile food trucks. Built for out-of-the-way refrigeration, these units can tuck under your prep tables and hold minimal amounts of refrigerated items. Some units come with a heavy-duty top to function as a prep table. Best for prep areas, small storage space, and needs. A combination of ice maker and storage bin, the undercounter can fit under most 40’’ high counters. Many will choose for an ice machine that is connected directly to a dispenser if they are lacking the space for a storage container. Best for drink stations and small volume ice needs. These mini units are available as simply refrigerated or heated versions, or you can opt for a specialty display unit such as a pizza display unit, popcorn/nacho merchandiser, or other unit. Best for small footprint display needs, pizza, popcorn, nacho display, bottled drinks. Cheese warmers heat up nacho cheese to a food safe temperature, maintaining that temperature for perfect pourability. Best for nacho cheese, condiment area. You’ll find that temporary concessions like at a fair or carnival can benefit highly from a mobile condiment cart, as guests can add their own toppings without holding up the line for concessions. Best for festivals, fairs, carnivals. What’s my specialty? You’ll find that most mobile concessions tend to specialize in one or a few items, and this specialty (for instance, funnel cake vendors) will determine which unit (funnel cake fryer) will take priority over others. Which units can be used for multiple tasks? Versatility is the name of the game when it comes to making the most of your space within a mobile concessions stand. While these units hold smaller and fewer sheet pans, countertop or mini combis are typically a perfect size for mobile concession operations that need to utilize a combi-oven unit. Best for small volume combi-oven needs. While not a food prep unit, sinks are still essential for any foodservice operation. Consider a portable sink for mobile operations. Best for all mobile foodservice operations. Keep in mind that the nature of mobile concessions requires that OSHA standards still be met, so items like portable sinks are essential to meeting legal requirements as well as maintaining a foodsafe environment. In addition to items best suited for either stationary or mobile concessions, there are many units that can work well in both situations. These grills can cook a hotdog to perfection and keep it at foodsafe temperatures for extended periods of time, allowing concession operators to invest minimally in labor while being able to provide large quantities of perfectly-grilled hotdogs. Equip your hotdog machine with a sneeze guard as well. Best for those planning to serve hotdogs and don’t want to cook them on an “as-needed” basis. These units can cook large amounts of hotdogs with steam while also warming buns! They are compact and easy to access. Soup kettles make great storage for prepared soups and are easily accessible for dishing out individual portions during rush hours. Best concessions offering hot soups. While just another type of countertop display unit, popcorn dispensers are aesthetically-pleasing, and popcorn is essential for concessions like movie theaters. Best for movie theaters, concessions at carnivals or circuses. 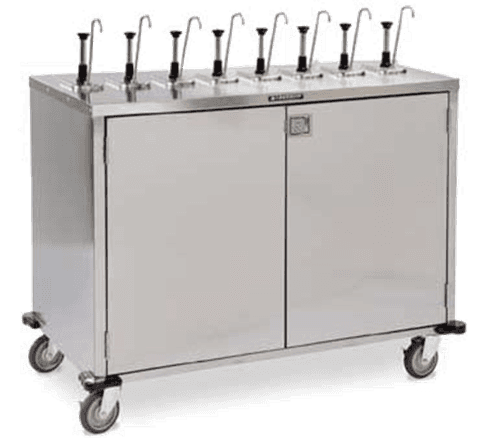 If you are planning to serve frozen beverages, these machines are ideal for prepping large amounts of frozen beverages for easy at-hand dispensing. Best for slurpees, ices and other frozen beverages. Hot and cold beverages alike are typically served “pour style”, meaning that you aren’t usually stocking prepackaged beverage containers but rather filling cups instead. Choose from both hot and cold drink dispensers depending on your menu and needs. Best for cappuccino or hot chocolate, and for cold Beverages (sodas, juices, etc). Using an ice machine with little storage and a direct dispensing unit can help cut down on the amount of space consumed by your equipment. Best for concessions with cold beverages. Best for small griddle usage and for small kitchens. Choose from a small countertop model if you’re serving only side items and minimal amounts of fried foods, or opt for a specialty frier like a funnel cake fryer if you’re only serving specialty fried foods. Best for funnel cake concessions and few fried menu items.